Venkat Shastri is currently Professor of Practice and Director of Industry Partnerships at the Shiley-Marcos School of Engineering. Prior to joining USD, he served as Chief Industry Advisor of PCN Technology, Inc., a position he assumed in December 2013 to strengthen the company’s strategic positioning in the market. In the preceding eight years, as President and CEO, he grew PCN into a market leader in communication, industrial networking and energy management solutions. Between 2002 and 2004, Venkat was VP of Engineering at Palomar Technologies, a packaging equipment and process solutions company serving the semiconductor, telecom and medical industry. At Palomar, he led engineering, and was responsible for all product releases and product roadmaps. Before this, he was Senior Director of Engineering and Product Development at KLA-Tencor, where he managed its automation products and solutions, and was a key customer interface to Intel. From 1988 - 2000, at JPL and then at SRI International, Venkat conducted research in robotic manipulation, legged locomotion, adaptive control and nonlinear systems. He grew the latter into a center of excellence in bio-automation. At JPL, he worked in the Space Telerobotics, Mars Pathfinder and Sample Return programs. 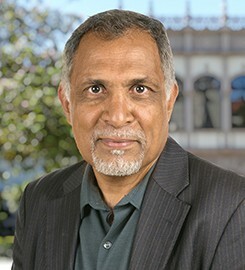 Venkat received his PhD in Electrical and Computer Engineering from the University of Massachusetts in 1988. He is the author of a book entitled, “Dexterous Robot Hands,'' (Springer-Verlag, 1990), and has published over 30 scientific articles in journals, magazines and conferences. He was Research Scientist at Yale University (1994 – 1996) and Consulting Professor at Stanford (1998 – 2000). He has served on the Editorial Boards of IEEE Computer Society and IEEE Control Society, and led the publication of two special issues, in the IEEE Robotics and Automation Transactions and International Journal of Robotics Research. He holds patents in controls, robotics, Bio-MEMS, and electro-active polymers, and has served as Principal or Co-Principal Investigator on large multi-center research grants and contracts. His passion, current research and commercial endeavors are focused on Sustainability. Venkat is a San Diego resident, and enjoys hiking trails all over the State of California. Submit changes to Venkat Shastri's profile.